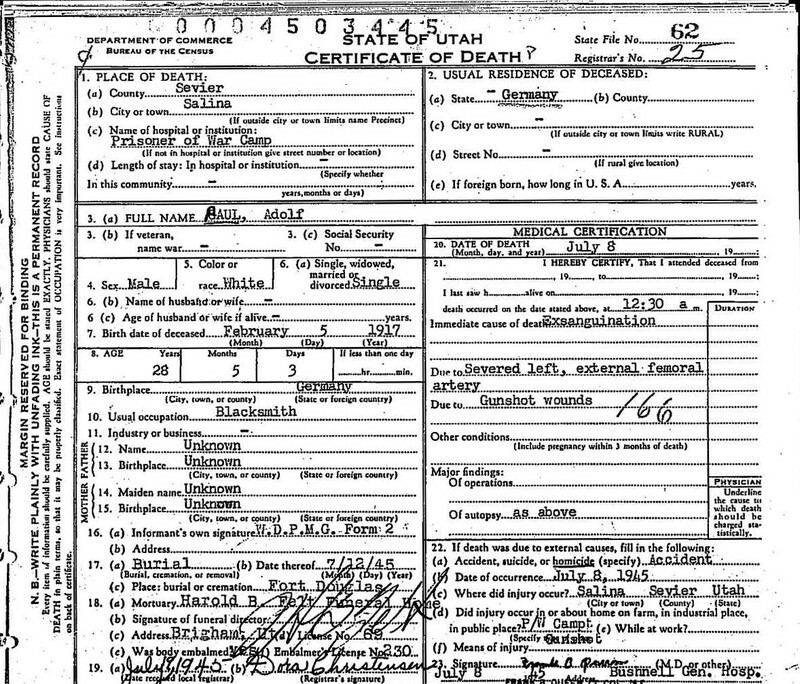 In 1945 a little-known massacre took place in Salina, Utah, proving to be the largest killing of enemy prisoners on American soil during World War II. 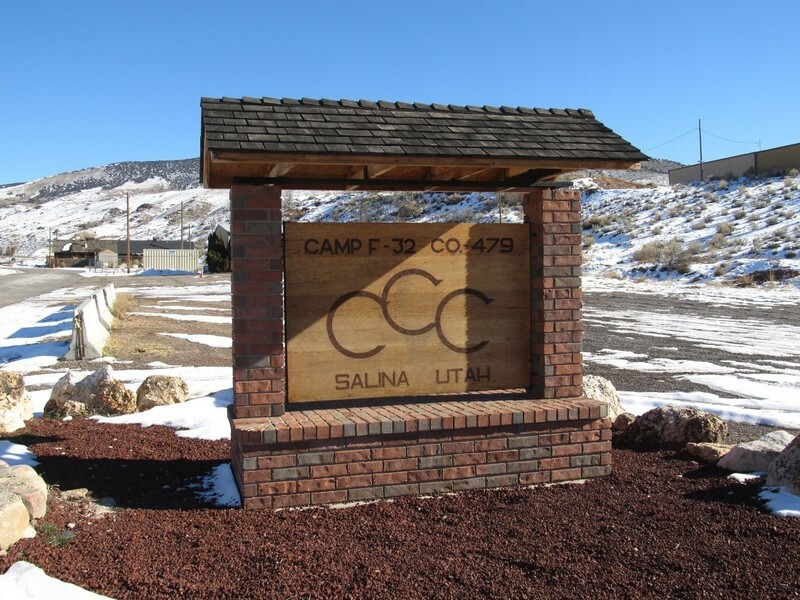 In Salina, Utah, the United States Government created a Prisoner of War camp to house around 250 German in an old Civilian Conservation Corps facility. Operated from 1944 to 1945, the military established the site as a subordinate institution to Fort Douglas in Salt Lake City to temporarily house overflow prisoners. Among P.O.W. camps it was unique for its location inside a town. Axis troops in the camp worked as agricultural laborers in the surrounding farms. In 1944, the Salt Lake Tribune reported the men to be peaceful, friendly and willing to work. The need for such P.O.W. camps dated to 1943 with the defeat of the German Afrika Korps. Allied forces sent many of the 100,000 men captured with the surrender to the United States, to relieve the pressure of housing them in Great Britain. The government spread these camps throughout the United States. After 1944, with the rapid advance of Allied forces in Western Europe after the invasion of Normandy, the need for more space to house the influx of Axis P.O.W.s grew exponentially. 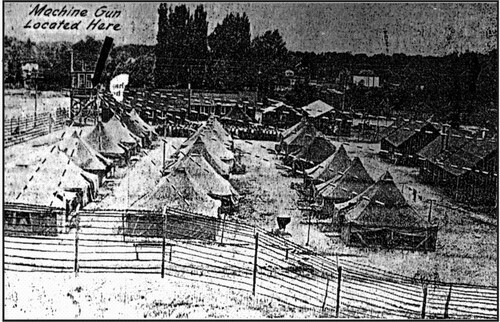 Across the nation the military and federal government created more and more camps to house the growing population, which reached 425,871 nationwide. Utah alone eventually held 15,000 German and Italian soldiers. Considering that the majority of young men in the United States had entered military service, the federal government instituted a program to use German and Italian prisoners for agricultural labor. Thus, the government sent out prisoners to agricultural areas to work in the fields. Such was the case in Salina, where the prisoners helped to harvest produce, such as sugar beets, on the surrounding farms. The Army selected soldiers considered unfit for frontline service, such as men with discipline problems, or those physically unfit, to guard the camp. One such soldier assigned to guard duty was Army Private Clarence V. Bertucci. Although Bertucci had enlisted in 1940, a series of discipline infractions meant that he remained a private after five years of service. While Bertucci had been overseas in England with an artillery unit, he had not seen frontline action. Shortly after midnight, July 8, 1945, the private went to his midnight post, manning one of the watch towers that overlooked the camp. Once there, he loaded a 250 round belt of .30 caliber ammunition into a 1919 Browning machine gun and proceeded to fire into the tents housing the sleeping prisoners. The attack ended in under a minute, killing eight and mortally wounding a ninth, who died a few days later in the hospital, Bertucci also wounded twenty other German P.O.Ws. After arresting Private Bertucci, the military investigation judged him mentally incompetent and thus remitted him to a mental institution. He remained institutionalized until his death in 1969. Not until 1948 did the American government inform the families of the slain prisoners about their deaths. In the 1960s, the American government built a memorial in the Fort Douglas cemetery. This remains the largest massacre of P.O.W.s on American soil during WWII. Christian Flanders, Northern Arizona University, “The P.O.W. Camp at Salina, Utah,” Intermountain Histories, accessed April 19, 2019, https://www.intermountainhistories.org/items/show/53. Allan Kent Powell. Splinters of a Nation: German Prisoners of War in Utah. Salt Lake City: University of Utah Press, 1989. Van Leer, Twila. Deseret News “Shooting Adds Tragedy to History of POWS in Utah.” July 4, 1995. Malmquist, O.M. Salt Lake City Tribune. “20 Others Hurt as Soldier Fires into Tents.” July 9, 1945.